Palestinian children are comforted as Israeli forces evict a Palestinian family from their home in Jerusalem’s Old City, February 17, 2019. Photo credit: Afif Amira for WAFA. The next generation of Palestinians in the holy city face a web of discriminatory and violent Israeli policies. In Jerusalem, Palestinians suffer from a web of institutional, personal, violent and quotidian forms of discrimination due to the Israeli colonial occupation. Yet, the Palestinian population in Jerusalem continues to grow. The Palestinian population in the holy city has increased fivefold since 1967 and now constitutes at least 38 percent of the city. In addition to posing a formidable challenge to the Israeli occupation, the Palestinian population’s increase means that more Palestinian children are growing up under a protracted military occupation. To understand the urgency with which the international community must act to end the Israeli occupation, one must grasp the discriminatory and violent policies that shape the lives and futures of Palestinian children in the holy city from the moment they are born. Israel formalized its 1967 annexation of East Jerusalem in 1980 when it passed Basic Law: Jerusalem, Capital of Israel. In December 2017, U.S. President Donald Trump legitimized the annexation too when he recognized Jerusalem as the capital of Israel. Palestinian children who live in Jerusalem are not born with a right to live in their hometowns. Since 1967, Palestinians in East Jerusalem have lived as “permanent residents” – an Israeli legal status that makes their presence a revocable privilege, rather than an inherent right. Permanent residency status is not automatically transferred through marriage or on to the holder’s children. Instead, around the time when Palestinian children enter high school, they are required to present themselves to Israeli authorities and supply proof that Jerusalem is at the center of their life according to the “center of life” policy. The “center of life” policy stipulates that if a Palestinian cannot prove that her everyday life revolves around Jerusalem then she will lose her residency rights to the city and be evicted to the West Bank. Even if a Palestinian can meet this strict standard, Israeli authorities retain the power to revoke her residency rights at any time. Between 1967 and 2016, Israel revoked the status of at least 14,595 Palestinians from East Jerusalem, according to the Interior Ministry. In Jerusalem, multiple kinds of schools are available to Palestinian children, though all of them except the Israeli schools are severely under resourced. Palestinian families tend to prefer to keep children in Jerusalem schools, as opposed to schools in the West Bank, to ensure that their children have a chance at obtaining permanent Jerusalem residency status under the “center of life” policy. In Jerusalem we face many problems regarding the education system, mainly in elementary schools. First, there is the issue of overcrowding in schools that are overseen by the Palestinian Education Ministry. Second, the areas where the schools are located are already crowded and the Israeli occupation refuses to issue construction permits to expand the schools. Finally, Israeli authorities continue to change the political aspects of the curriculum by censoring everything related to Palestinian national identity. Palestinian Jerusalemites can attend Israeli municipal schools overseen by the Israeli ministry of education, which supplies curriculum that hostile to Palestinian identity and critiques of Israeli colonialism. Secondly, Palestinian children may attend schools overseen by the Islamic Waqf, which uses curriculum supplied by the Palestinian Authority (PA) Ministry of Education. In Shuafat Refugee Camp, Palestinian children attend schools run by UNRWA, which also teach the PA curriculum, though Israeli authorities have recently threatened to shut down these schools. Finally, there are some private schools in the area, which attain financial support from donations, tuition and sometimes the Israeli municipality. A classroom in Issawiya. Photo credit: Wadi Hilweh Information Center. Palestinian children in Jerusalem suffer from a lack of classrooms and inadequate classrooms. According to Israeli human rights group Ir Amim, there is a shortage of around 2,000 classrooms in East Jerusalem. According to the United Nations Development Program (UNDP), around 43 percent of existing classrooms are inadequate due to overcrowding and poor infrastructure. Israeli authorities maintain a discriminatory zoning regime in East Jerusalem that almost outlaws Palestinian residential construction of all kind in the area. Consequently, Palestinian schools cannot expand to account for the deficit in classrooms. Jerusalem schools that serve Palestinian children have extremely high rates of students dropping out. According to Ir Amim, the dropout rate for schools in East Jerusalem has reached 33 percent. The UNDP points out that inadequate infrastructure for schools and classrooms leads to high drop-out rates. Ir Amim reports that around 17,000 children, or around 13 percent of all children in East Jerusalem, are not registered in a known educational institution. Israeli forces demolish a house in Jabal al-Mukaber, October 17, 2018. Photo credit: Wadi Hilweh Information Center. In the last five years, Israel has demolished 785 Palestinian-owned structures in Jerusalem. Many Palestinian children are made homeless by these demolitions, as typically entire families are abruptly displaced and fined thousands of dollars for “illegal” construction. Israel demolishes most Palestinian-owned property in Jerusalem under the pretext that the structures were built illegally, meaning without Israeli-issued construction permits. However, Israeli authorities almost exclusively issue construction permits to Israeli Jewish neighborhoods and settlements. This is because the city has not approved an urban plan for East Jerusalem and zones only 8 to 13 percent of the area as for Palestinian residential construction. As a result, Palestinians build without permits to avoid overcrowding. The Association for Civil Rights in Israel found that 20,000 homes in East Jerusalem – or 39 percent of all homes in East Jerusalem – lack Israeli construction permits and therefore live in perpetual threat of abrupt homelessness. Palestinian children in Jerusalem are served by Israeli hospitals and Palestinian hospitals. The Palestinian hospitals are currently being defunded by the US. US President Donald Trump has framed the funding cut as a way to pressure Palestinian negotiators to accede to policies of Israeli occupation. US President Donald Trump ordered the State Department to withhold 25 million dollars earmarked as aid to Palestinian hospitals in Jerusalem in September 2018. Six Palestinian hospitals that constitute the East Jerusalem Hospital Network (EJHN) are the targets of the decision: the Makassed Islamic Charitable Hospital, Augusta Victoria Hospital, Red Crescent Maternity Hospital, St John’s Eye Hospital, Princess Basma Rehabilitation Centre and Saint Joseph’s Hospital. Israeli forces detain Palestinian youth in Shuafat Refugee Camp, 11/21/18. Photo credit: Wadi Hilweh Information Center. Israeli authorities apply civilian criminal law to Palestinian children in Jerusalem, unlike Palestinian children in the West Bank, who are incarcerated as “security prisoners” under military law. Yet, Palestinian children in Jerusalem are in the constant presence of Israeli police and are subject to Israeli civilian criminal laws that target them for incarceration. During these arrests, Israeli forces violate the law and rights of Palestinian children by, for example, interrogating them without the presence of parents or a lawyer, denying family visitation, and even subjecting them to torture, as many said of the interrogation of 13 year old Ahmad Manasra. Addameer: Prisoner Support and Human Rights Association reports that in 2017 Israeli police arrested a total of 1,138 Palestinian children in East Jerusalem, representing 17 percent of total arrests for the entire Palestinian population that year. Addameer emphasizes that in light of the fact that the Palestinian Jerusalem population reflects just 6 percent of the total Palestinian population in occupied territory, Jerusalemite children are arrested at disproportional rates. The extension of administrative detainee status to children is another cause for action, a practice Israel recently revived the practice while arresting Palestinians for Facebook posts that allegedly “incite to violence.” Israeli law authorizes the use of administrative detention in Jerusalem, meaning indefinite imprisonment without trial or charge, based on “secret evidence” supplied by Israeli intelligence forces. Fatima Abed al-Rahman Hajeiji, 16, shot by Israeli police at Damascus Gate in Jerusalem, May 7, 2017. Photo Credit: Palestinian News and Info Agency. Occasionally, Israeli forces shoot and kill Palestinian children in Jerusalem. Usually, Israeli police claim after killing Palestinian children that they attempted to stab Israelis, as in the case of 16-year-old Fatima Abed al-Rahman Hajeiji. Palestinians protest in front of a Jerusalem court for the trail of the murderers of 16 year old Mohammed Abu Khdeir, March 2014. Photo credit: Afif Amira for WAFA. 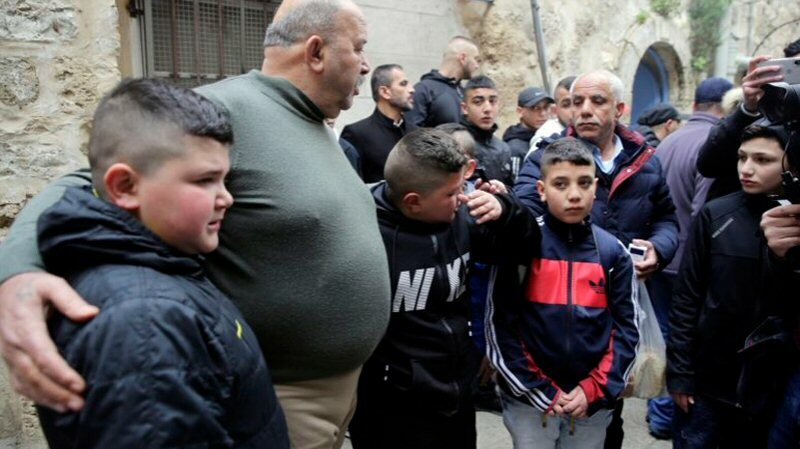 Palestinians in East Jerusalem suffer from nationalist-religious Israeli colonial settlers who occasionally commit violence against Palestinians, including children, as a racist political statement. This environment is a daily source of anxiety for both Palestinian parents and children. The most notorious recent horror of this kind was the kidnapping and death of 16-year-old Mohammad Abu Khdeir in 2014. The three Israeli settlers kidnapped Abu Khdeir from his neighborhood in East Jerusalem and burned him to death.